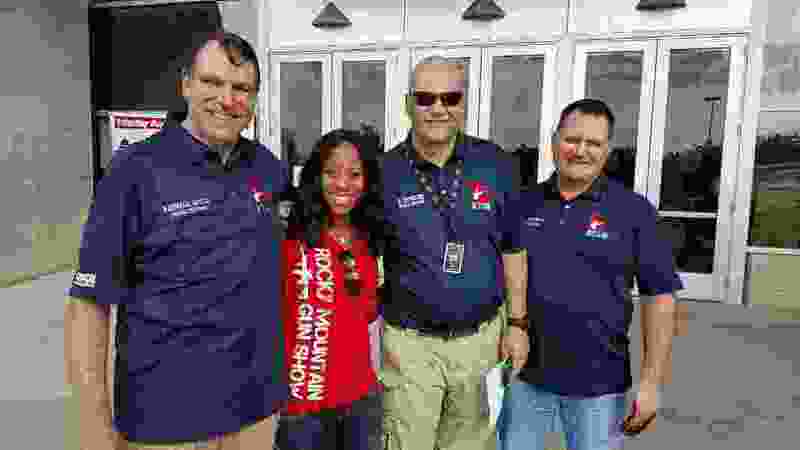 (Photo courtesy of William D. Pedersen, Utah Shooting Sports Council) U.S. Rep. Mia Love, R-Utah, stands with three members of the board of the Utah Shooting Sports Council, a gun-rights group, in 2015. After Love wrote an opinion piece in the Deseret News saying she was open to gun-control measures, the Utah Democratic Party tweeted a version of the photo. An apparent attempt to clarify her position in favor of certain gun regulations exposed a politically tricky issue for Rep. Mia Love over the weekend, as Utah Democrats said the congresswoman has ties to the gun lobby and a gun enthusiast accused her of “waffling” on the issue. In an opinion piece, Love called on Congress to look at various new regulations, repeating her position of looking at “everything on the table.” Utah Democrats were quick to share a photo of her locking arms with the gun lobby and asserting she collected tens of thousands of dollars from gun rights advocates. The party sent out an August 2015 photo showing Love in a Rocky Mountain Gun Show T-shirt with three board members for the Utah Shooting Sports Council, a gun-rights group. In the photo, Love stands alongside Clark Aposhian, Bill Pedersen and Randall Doyle, members of the council’s board whose group has fought for easing gun restrictions and against gun-control measures. “A picture is worth a thousand words,” the Democrats wrote on Twitter. The prodding followed weeks of intense focus on gun control nationally and general – and at times unclear – statements by Love about what new regulations she would support. Democrats shared the photo on the day an estimated 8,000 Utahns – and hundreds of thousands more nationwide – marched and called for gun reform. The Deseret News also ran an opinion piece from Love the same day, when she continued saying she was listening to the issue. “I’m willing to put everything on the table, including bump stocks and exploring judicial processes to prevent guns from getting into the wrong hands,” she wrote in the letter. She declined to say in a meeting with The Salt Lake Tribune editorial board last month whether she supported banning certain high-capacity, semi-automatic rifles. But she said she’d consider any proposal that data show could be effective in stopping gun violence. Immediately, she said, she wanted to see what schools needed to improve security. She said she didn’t know whether armed teachers would be part of that equation. “Are you really not sure about arming teachers?” asked Tim Fitzpatrick, executive vice president of The Tribune. “I’m not opposed to it, but I want to know how that looks,” Love said. The campaign said Love’s public statements, the opinion piece and past interviews have made her position clear. But Pedersen, one of the men in the photograph from 2015, says his group is looking for more information from the congresswoman. In a private Facebook page for conservative Mormons, Love wrote more about her position. Pedersen and Aposhian said the group was trying to set up a time to meet with Love and discuss her position on the issue. The group opposed a bill filed late during the past Utah legislative session that would have allowed family members to petition a court for a restraining order to keep guns away from someone deemed to be an imminent risk of suicide or a threat to others. The measure was quickly killed. Aposhian deliberately steered clear of criticising Love. “I’m not ready to condemn anybody for having a dialogue about this. We welcome a conversation,” he said. As for Salt Lake County Mayor Ben McAdams, a Democrat running against Love, Aposhian said he hadn’t met with him. “I’d like to see what his position is. I’d like to see what everybody’s position is, including [President Donald] Trump’s position, honestly, because he goes back and forth,” Aposhian said. McAdams, who hadn’t spoken out about guns during his campaign, laid out his position for the first time in a statement to The Tribune on Monday. He said he supports outlawing bump stocks, raising the age limit for purchasing assault-style weapons and improving the background check system for gun purchases by requiring them for gun sales made online and at gun shows. “With rights come responsibilities — including the responsibility to keep guns out of the hands of domestic abusers, criminals, terrorists and those suffering from severe mental illness with the propensity for violence,” McAdams said. Love supported a bill that seeks to increase the amount of information that’s shared with a national background check system, which currently leaves open the possibility for gaps from state to state in someone’s eligibility to purchase a gun because not all states and local governments share the same information. That bill included a provision that would allow people with a concealed-carry permit in one state to travel into another. Currently, a patchwork of states allows so-called concealed carry reciprocity. But the issue has stalled in the Senate over Democrats’ concerned about expanding concealed-carry. Utah Democrats in their criticism of the Republican claimed Love’s campaigns have collected over $93,000 from gun-rights advocates during her U.S. House campaigns, citing information from the campaign finance tracking nonprofit Center for Responsive Politics. Love’s campaign disputes the amount, saying the center’s numbers are speculative and misleading because they count donations from people who also support gun-rights groups like the National Rifle Association, and don’t provide the underlying data of those donors. A spokesman from the center said the group includes people who have given at least $200 to an interest group like the NRA and then donates to a candidate. Love has received $3,000 from the NRA.